If there were no consequences, like possibly turning orange or becoming orange-shaped, I think I would eat mac and cheese every day of my life. 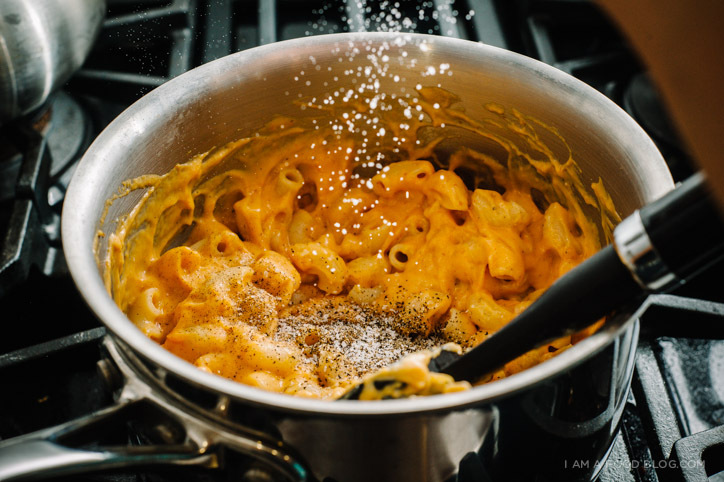 Stove-topped or baked, with breadcrumbs or without, with add-ins or plain, mac and cheese is one of my ultimate comfort foods. Mac and cheese totally brings me back to childhood, probably because I consumed so much of it. I haven’t had Kraft Dinner in ages, but I’m almost tempted to buy myself a box just to see if it’s as good as my memory tells me. It probably isn’t though, because as soon as I figured out how to make mac and cheese from scratch, KD was out the door. The first time I made mac and cheese from scratch I didn’t know what a white sauce was. I just dumped some shredded cheddar into a pot of freshly drained noodles, stirred it around and called it a day. 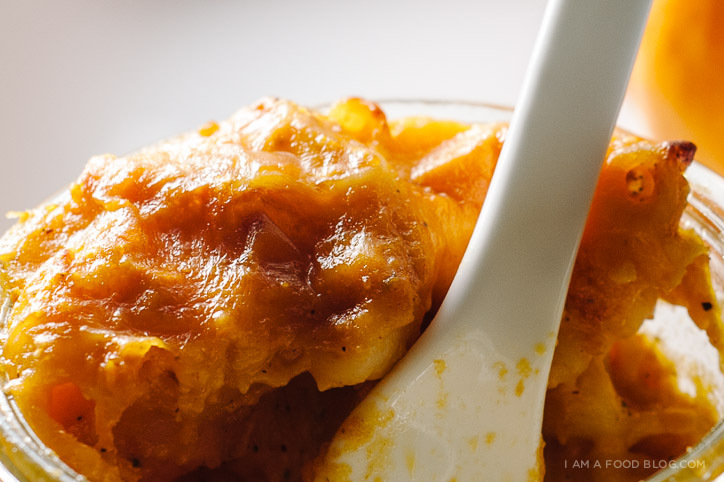 It was a delicious day – all stringy and gooey – but it wasn’t at all like the ultimate silky, smooth cheese sauce I had tasted at a favourite neighbour’s house. After consuming the whole pot, I made the long trip next door to interrogate my kindly old neighbour about her mac and cheese. She told me about this magical thing called white sauce that was the base of any delicious mac and cheese. And even though I had just finished eating a rather large pot of noodles and cheese, I didn’t say no when she told me she’d show me the secrets of white sauce. “Hot roux, cold milk,” she whispered quietly, like it was a real secret. I don’t really know if hot roux, cold milk is much of secret, but I do know that I never have lumps in my sauce. You too don’t have to have lumps in your sauce: just make sure that your roux is hot, but not too hot, and add the cold milk in a slow, steady stream. White sauce is a awesome blank slate – throw some cheddar in and you have your basic mac and cheese. I decided to stir in some pumpkin for a fall twist. I’ve been dying to work pumpkin into mac and cheese and now that it’s October, I just decided to go for it. 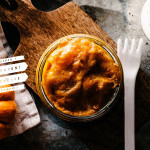 When I tasted it right out of the pot, I wasn’t sold on it – it tasted a bit too sweet for me – but after baking in the oven the flavours mellowed out and I was totally addicted. 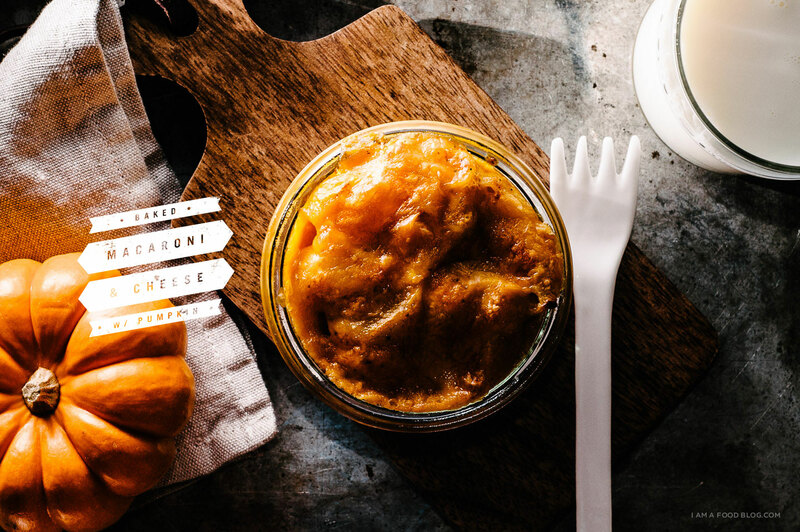 The pumpkin puree added just that little bit of something different to a classic favourite, making it all the more tempting. Boil your macaroni until al dente, according the package. Drain, rinse with cold water, and set aside. Over medium heat, melt the butter. Add the flour and stir constantly over medium heat for about three minutes, until smooth. Pour in 1 cup of the milk in a thin stream while whisking. When smooth, add the rest of the milk. Add the salt, pepper, dry mustard and nutmeg. Keep on medium heat and stir for about 10 minutes, until the sauce thickens. Taste and adjust salt and pepper if needed. Remove from the heat and stir in pumpkin and 2 cups of the cheese. Stir until melted. Add the cheese sauce to the noodles and gently mix. 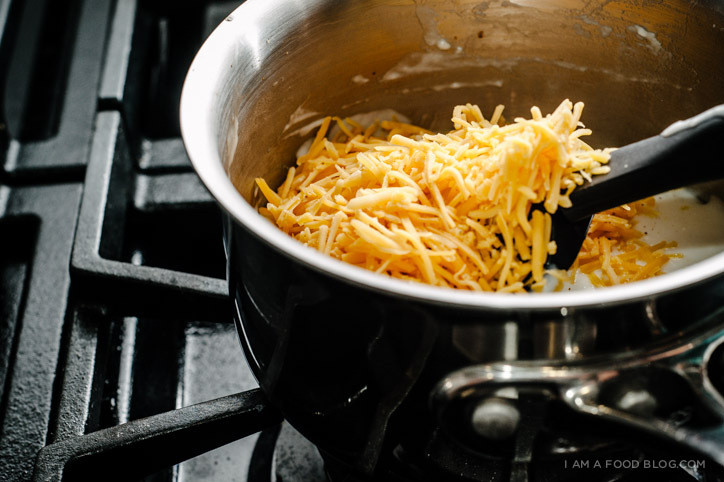 Pour the cheese and noodle into a 2 quart oven proof baking dish. Sprinkle on the remaining 1 cup of cheese. Bake for 25- 30 minutes or until golden brown and crispy. Enjoy hot. Dang, I’m definitely trying this!! 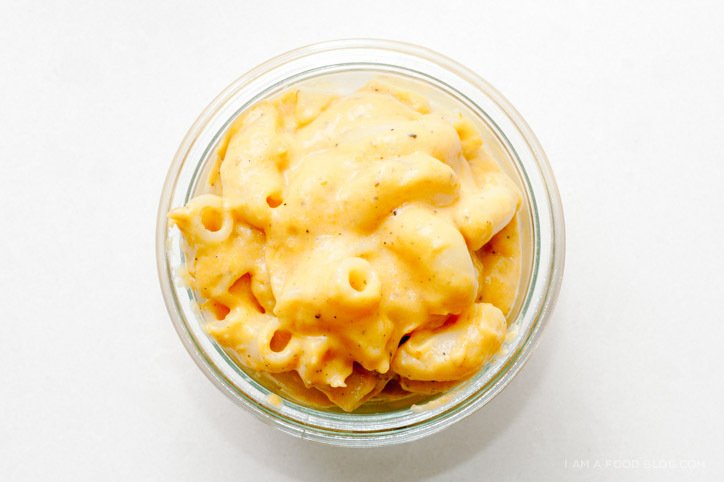 What a great idea to add pumpkin to Mac and cheese. I’m going to have to try this soon! This looks super easy…love it!! 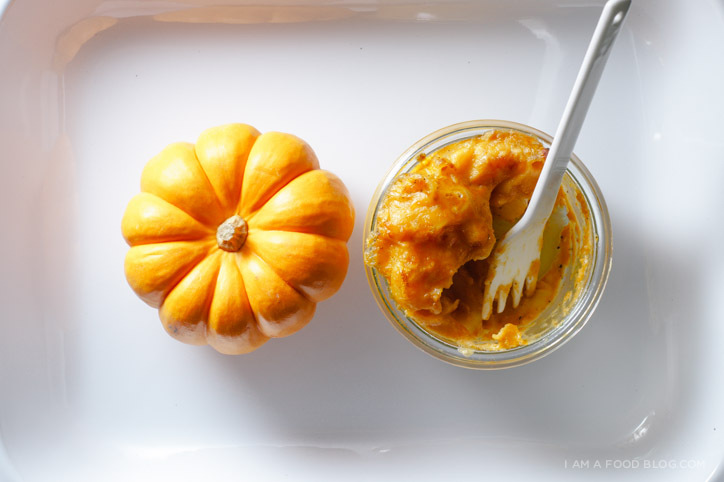 I’ve been adding pumpkin to EVERYTHING the last month! Pumpkin cookies, french toast, omelets, and enchiladas (which is on my blog). I will definitely have to try this mac! Made this tonight with alterations to make it gluten free. Totally amazing! We made this tonight and it was amazing! Added a pinch more salt and pepper to taste along with extra sharp cheddar cheese (more on top than one cup). Sooooooo good! Thanks! Oh and we used vegetable (carrot and squash) macaroni noodles by Barilla! Wow! 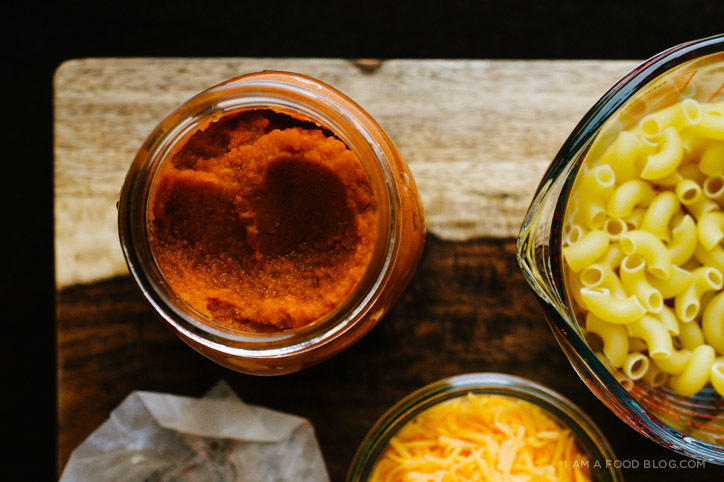 This is like, the healthiest version of mac and cheese I’ve ever seen! And I can get these things here! I WILL be making this! Thanks! how many servings is this? 4-6? I’m thinking of making it for 20-25 people! Approximately how many servings does this make? It looks so delicious! Also, if I use a different noodle shape, such as fusilli (just what I have on hand), do you think I would need to change the amount of pasta? Or would it remain the same? Thanks for the advice! It should be about the same! 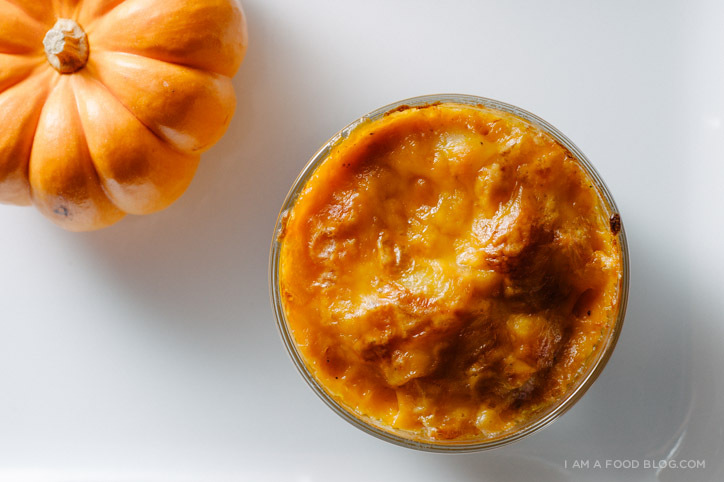 I made this recipe over the weekend for a pumpkin potluck (each food had to be pumpkin-flavored) and this was the crowd favorite among contenders like pumpkin, sausage stew, pumpkin cupcakes, etc. 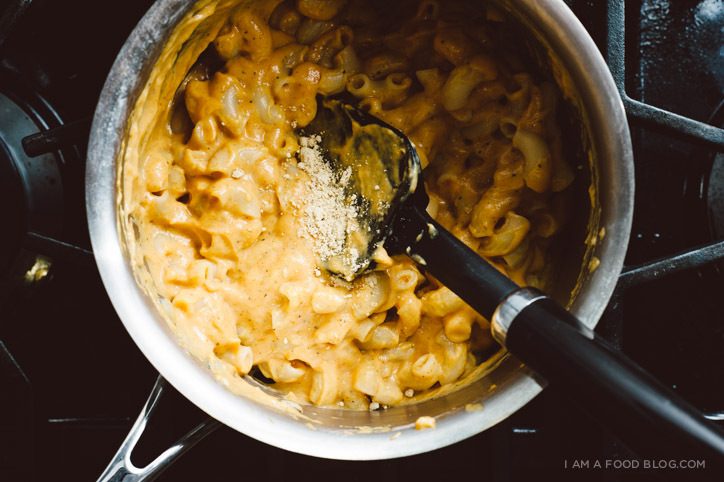 This was my first time making mac n cheese from scratch and your well-written recipe made it a breeze. Thank you for a delicious and reliable recipe!